This entry was posted on Tuesday, September 25th, 2012 at 4:00 am	and is filed under My Family, Vegetables. You can follow any responses to this entry through the RSS 2.0 feed. You can leave a response, or trackback from your own site. As lovely as the beans are in the photograph – and their fuschia and butter shells are gorgeous – neither their picture, the photo of the completed dish nor even the reality of the dish at the table fully do justice to the wonderful flavor of this dish. I was fortunate to have been there, at Tinky’s dinner, when they were served and was surprised that I had not only seconds but thirds. Jan was right in favoring this succotash. Part of my surprise and delight was that the succotash I’d grown up with was the vegetable melange served in elementary school cafeterias: canned corn and lima beans, sometimes with canned peas added as well. If there ever was green pepper as an addition, it was done in a manner to insure that the outcome was even more revolting. Tinky nailed Jan’s succotash in describing it as “nutty” in taste. It is a heavenly nuttiness; it is her recipe that reveals that succotash can be sublime. Serve the succotash along side a plate of fine Roquefort and with a splash of bourbon on ice and you’d have a fine way of remembering Jan tomorrow, on her birthday. Tinky … I planted these this year and just loved them … they take a lot of space in the garden, but they are really yummy and worth it! Love your recipe. I enjoyed the posting about your mother and her succotash recipe. As always, brilliant writing! 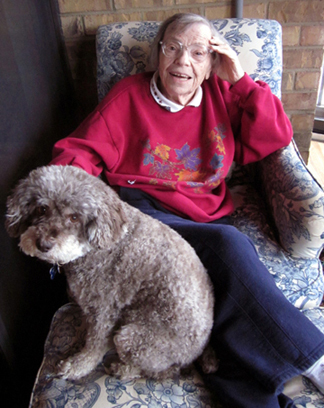 I will think of “Taffy” on her birthday with warm wishes to you and the family. What beautiful beans! I’d have bought them as well, although I’m not sure I’d have known what to do with them…but now I do. Like Flaneur, I remember succotash as being a particularly nasty dish because, what kid likes lima beans? Now, of course, I love lima beans. Go figure. I think I can find dried cranberry beans. Tinky- My brother and I had several phone calls a few weeks ago about Mom’s succotash recipe, or what we could remember of it. I was trying to recreate it, but it was just not the same. After several attempts using canned beans, we finally decided it had to be Dad’s beans from his garden that made the difference. I hated shucking those beans when I was a kid, so I bought canned beans instead, haha… big mistake! Your speckled beans are just the same ones I remember from years ago, carefully hoeing and weeding around as seedlings, then picking, and later shucking on those hot summer afternoons, lol… needless to say I don’t grow my own so I’ll have to find a store or stand that sells cranberry beans and try your Mom’s recipe. Thanks! I love the Roquefort and bourbon idea, Flaneur, and thanks for the kind words about this dish. Same to you, Carol; it’s lovely to think of her. And of you. Grad, you could certainly try this with fresh limas as well! I love your memories, Mattenylou. I hope you found the beans! Let’s enjoy the memories, Anne! I love coincidences. When I was a little girl growing up, my mother would make the same thing. We called them October Beans and she would put white corn with them to make succotash. One of my best memories with my mom. I believe she learned this from her mother. This brings back great memories of the meals we had when I was a kid. I love hearing stories like that. Thanks for visiting, Nancy! This recipe is very similar to the succotash that my Grandmother Katherine Maloney, and my mother (who would have been 100 on June 3) made and I ate growing up on Eastern Long Island (NY) in the 1950’s and 60’s. Pretty sure her recipe also had baby lima beans, and possibly salt pork. Can’t find her recipe, and the succotash recipes on line were all wrong, until i entered “cranberry beans.” Thank you! And September 26 is my birthday too! Someone up there helped me find this recipe. Happy almost birthday, Karen. Your grandmother and my mother sound like kindred spirits. At last!!! I have so many discussions with people about lima beans and succotash!!! 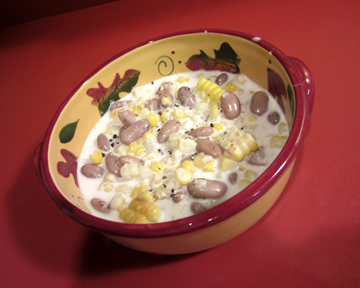 I never had a lima bean in the succotash made by my grandmother, my aunts or my mother…thank God! I hate lima beans. I tell people succotash is made with “shell beans.” The cranberry beans are what I always had from my family and finally I find the same exact recipe! Thank you, thank you, I now won’t have to argue with people about my true succotash. 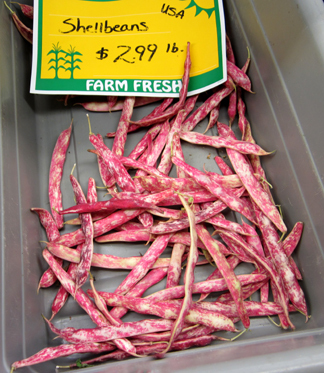 For some reason, vegetable stands don’t seem to sell shell beans the way they did when I was a kid. So, this year I bought some heirloom seeds of cranberry beans and grew my own shell beans!!! Tonight we are to have my succotash the way I remember it…not something made with lima beans! Thank you, thank you. Hi, Donna–I’m glad to have found a fellow non-lima-succotash lover. I hope your succotash was divine!